The waterbed industry has changed over the years. In the 1980’s The wood framed waterbed was the sought after item. Heavy solid wood, many with lighted bookcase headboards and drawer bases. Most waterbeds were a Western / Country theme or Danish Modern light bridge design in oak or maple. That’s what was available. Over time competition drove the price down and with the lower prices came lower quality. We decided to exit that market. 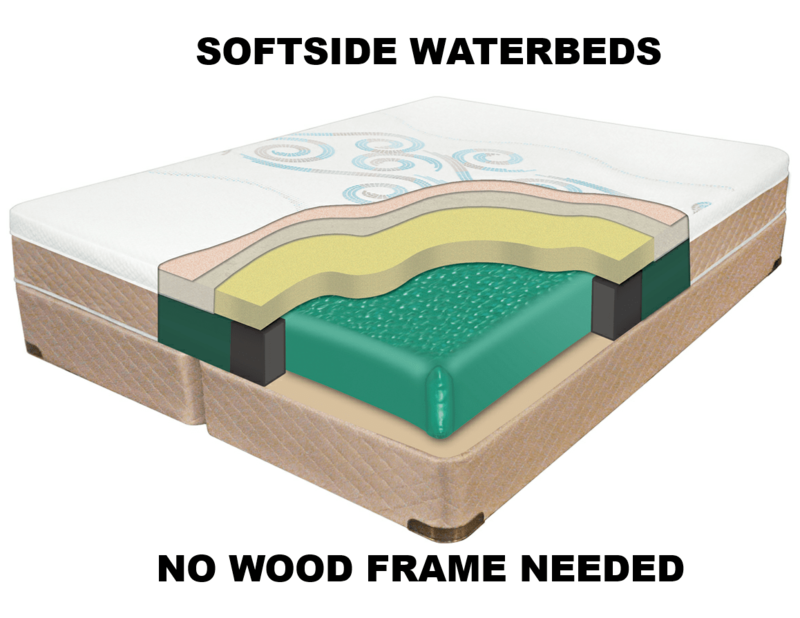 We stopped selling wood framed waterbeds in 1993 but we stayed in the waterbed business with “softside” waterbeds. Wood frame waterbeds have all but disappeared since then. If you need replacement parts for wood framed waterbeds, we still have replacement parts and supplies, ie. mattresses, liners, heaters, conditioner and patch kits. The waterbeds today are without wooden frames, commonly called “softside” waterbeds. They look like a regular mattress. You wouldn’t know it is a waterbeds until you lay down. Then you find that relaxing pressure free float a waterbed gives. Plus they are available in all standard sizes and also California king. We have softsides with dual bladders that can be filled to a different firmness on each side of the bed and also dual heater systems allowing for different temperatures on each side of the bed. Softside waterbeds can be used with most bedroom groups. It’s just a simple conversion needed to have a waterbed in your existing bed frame. We can convert most beds to waterbeds. This is a FREE FLOW waterbed mattress. It is essentially a bladder with water. There is no wave reduction built into it. It has a smooth top with T-SEAM construction and reinforced durable ultra guard corners. The GENESIS 400 waterbed mattress has wave reduction built into it. The wave motion has been reduced 40 to 50%. It has 2 layers of motion control giving extra body support. Made with specially formulated Pearlized Azure Vinyl, a smooth top, 1 inch double strength corners, 4-way tethered support system and a 20 year limited warranty. It is available in all wood framed waterbed sizes. Cal King, Cal Queen and Super Single. The GENESIS 600 waterbed mattress has wave reduction built into it. The wave motion has been reduced 60 to 70%. It has 7 layers of motion control giving extra body support. Made with 22 Mil Aqua Marine Vinyl, a smooth top, L-Seam construction with recessed black bottom, 2 inch double reinforced corners, 4-way hook & eyelet tethered support system and a 20 year limited warranty. It is available in all wood framed waterbed sizes. Cal King, Cal Queen and Super Single. The Guardian Quantum Heater for wood frame Waterbeds is a 300 WATT heating element. It is to be used on wood frame waterbeds only. NOT FOR USE ON SOFTSIDE WATERBEDS. The temperature control is available as a digital control or an analog control. We stock both types. The Thermal Guardian Quantum Heater for softside waterbeds is a 120WATT heating element LOW WATT. It can be used on a softside waterbed or a wood frame waterbed. The heater doesn’t heat the waterbed as quickly as a 300WATT heater but it is safe for the softside waterbed fabrics.